Due to recent high profile media campaigns and the worldwide popularity of Blue Planet 2, awareness of the ocean plastic crisis is at an all time high. Within a few short decades, this colourful, flexible, long-lasting material has made it into every corner of our lives, and it’s now wreaking havoc in our oceans. It’s estimated that 1 million seabirds and 100,000 marine mammals and turtles are killed by plastic every year, however we’ll never know the true toll. Whether it entangles, chokes, poisons or starves – ocean plastic is bad news for marine wildlife which means it’s bad news for humans too. We can’t pretend our survival isn’t dependent on healthy oceans. Marine plants produce 70% of the oxygen we breathe, so it’s in our interests to protect fragile marine ecosystems and take any action possible to minimise the extent to which plastic is entering our food chain and contaminating fish and seafood. Whilst efforts to remove plastic from the ocean are welcome, they aren’t going to be game-changing. It’s going to be impossible to retrieve all the plastic we have already allowed to escape into the sea. With the world’s deepest plastic bag recently discovered at the bottom of Mariana Trench it’s clear we need to focus on turning off the tap to stop new plastic entering our oceans and prevent the crisis worsening. 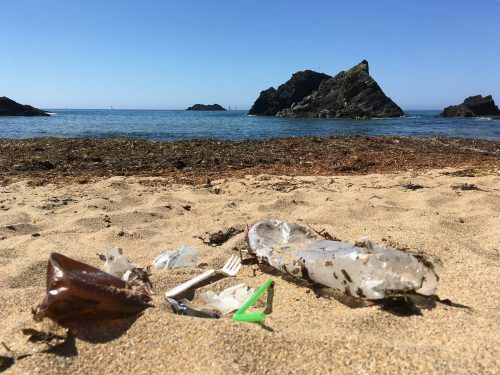 But with 18 billion tonnes of plastic ending up in the oceans each year, what can we as individuals, employees, teachers, businesses and community organisations do to stem the flow? 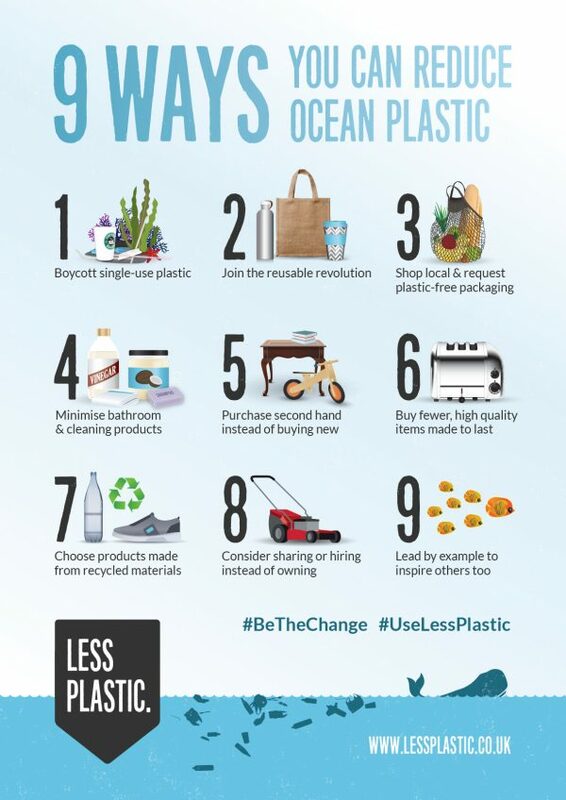 What can YOU do to reduce ocean plastic? The most important action you can take is to boycott single-use plastic. In 2016, we produced over 300 million tons of plastic worldwide, of which HALF was destined for a single-use purposes. We’ve bought into the consumerist dream that it’s more convenient to mine, manufacture, transport, store, sell and dispose of single-use plastic items, than it is to simply wash up our reusables. This is clearly not true. The burden of our global single-use plastic addiction is far reaching. Waste disposal infrastructures are not fit for this purpose. Most single-use plastic is not recyclable, or even when it is, only a tiny fraction is actually recycled. Even in developed economies, rubbish collection services are imperfect and landfills are overflowing, resulting in plastic escaping into the environment. In many countries there is simply nowhere for single-use plastic to go except open dumps or straight into a river, which of course leads to the ocean. Until very recently these countries used locally produced goods that didn’t require plastic packaging. Plastic pollution is one of the negative by-products of globalisation. Most single-use plastic is not necessary. It has evolved as a convenient way for corporations to profitably get their products to us. Open your eyes to the single-use plastic in your life, and make a pledge to try to live without it. Need more convincing? 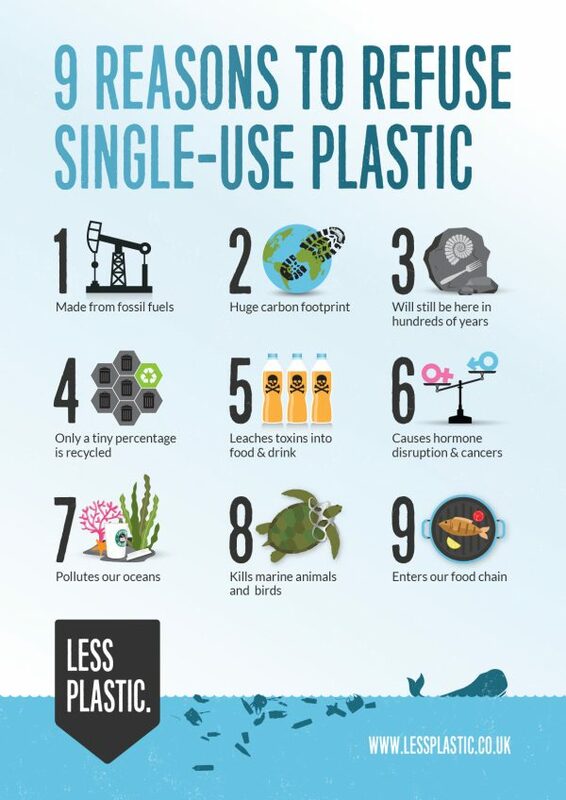 See our 9 reasons to refuse single-use plastic. Carrying a few reusable essentials with you (such as bags, bottles, cups, straws and even take-out containers) is not only more planet-friendly, but it’s often cheaper too. In many countries you now have to pay for disposable bags, and many coffee shops offer discount incentives for BYO reusables. 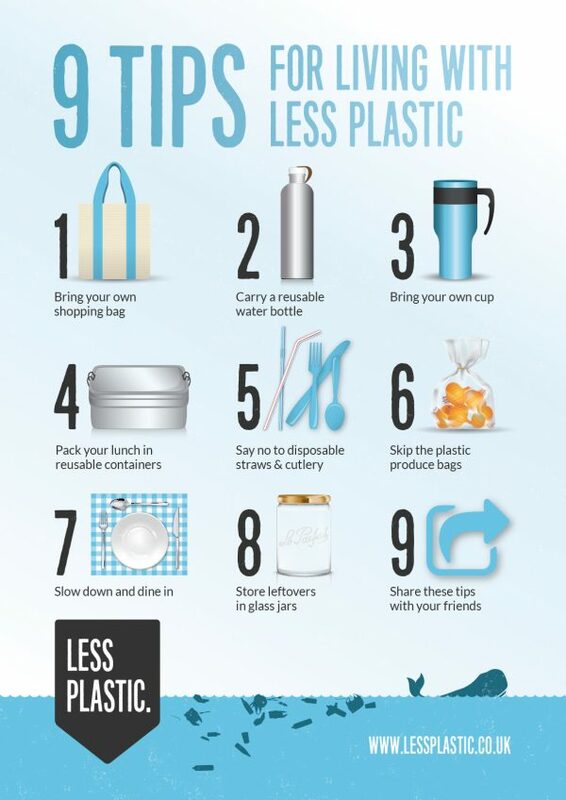 Our 9 tips for living with less plastic will help with more ideas on how to avoid single-use plastic. 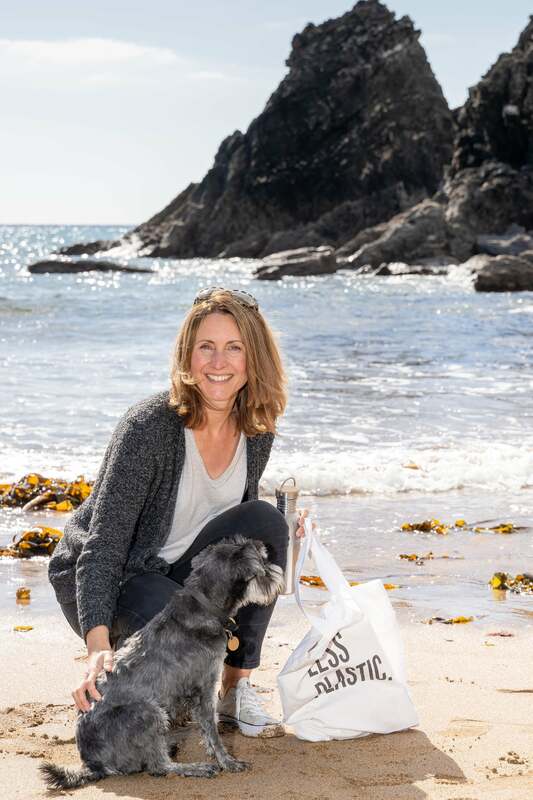 If you own or manage a hospitality business, you have the opportunity to phase single-use plastic out of your business – encouraging your customers to bring their own reusables, or use yours if they’re dining-in. You could even trial a deposit system on take-out reusables. 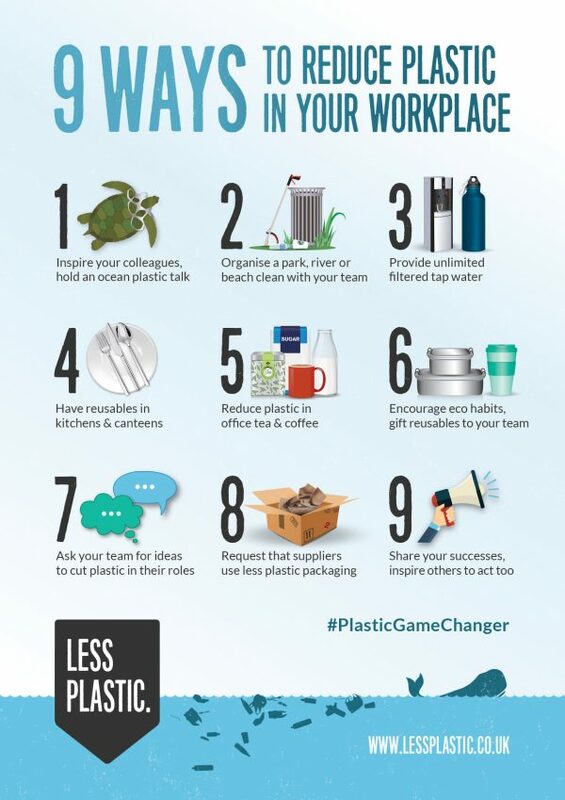 For more ideas for hospitality businesses, see 6 ways we tackle ocean plastic. Another important aspect is shopping. Every time we buy something is a vote for what we want more of. If you don’t want more plastic packaging, then it’s important to make an effort to avoid buying it. One of the easiest ways to do this is to shop local and request plastic-free packaging. Local stores are more likely to listen to their customers, and the produce you buy generally has shorter supply chains, so plastic is easier to cut out. Plus you’ll be supporting your local economy which is always a good thing! If you’re unable to avoid supermarkets, give them feedback on social media, via email or letters to let them know you demand plastic-free alternatives. As customers we’re more powerful than we realise, and with today’s technology it’s never been easier to make our views known. Minimising bathroom and household cleaning products can result in significant plastic reductions. Simply cutting the number of products you have (e.g. by deciding on your ‘essential’ cosmetics and just sticking to those few items) will make a huge difference over time. Swapping products that come in plastic bottles for unpackaged alternatives (such as shampoo bars), switching wipes for reusable cloths, and choosing reusable menstrual products instead of disposables all help greatly too. A cupboard full of different cleaning products designed to tackle a different part of your home is really not necessary. A re-purposed spray bottle filled with 1 part white vinegar 2 parts warm water is just as effective, contains less harmful chemicals and results in far less plastic waste. 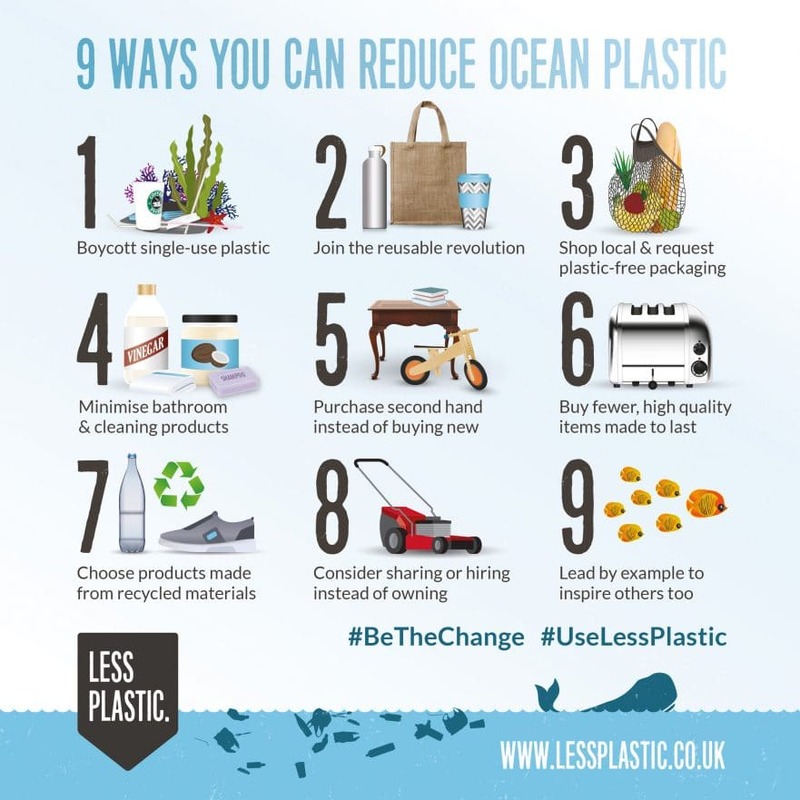 For more inspiration see our 9 more tips for living with less plastic. Purchasing second hand items instead of buying new avoids the plastic packaging that invariably comes with new purchases. It also means that perfectly good things that are no longer required by their current owners will not end up in landfills. Furniture, books, clothes, toys, children’s clothes, baby gear, electronics, musical instruments, cars, bikes and sports equipment are all great things to look for second hand. Not only is it good for the planet, it will be good for your pocket too! When you do need to buy something new, it’s best to invest in fewer, high quality items designed to last. We received a high quality toaster as a wedding gift 16 years ago. It is been used several times a day, and worked perfectly for the first 14 years. When it stopped browning one side, because it was a quality item we contacted the company to repair it (which we paid for) and received our toaster back a few weeks later in perfect working order. We preferred to pay for repair rather than buy a cheaper toaster that may only last a few years and then languish in landfill forever. Buying better things, less frequently involves less plastic packaging, and often less plastic on the products themselves, or if they are made of plastic, the lifetime will be longer. Buy Me Once is an excellent resource showcasing quality products that are built to last. Choosing products made from recycled materials results in less demand for new plastic to be manufactured, and also supports this emerging sector which is working hard to ‘close the loop’, keeping plastic in use rather than having it end up as worthless waste. Creating demand for products made from recycled materials gives plastic waste a value, and means it is less likely to end up in our environment. Growing up in a consumer society, this one can be hard to get our heads round, but the truth is, we don’t always need to own things, and with an ever-growing population on our planet with depleting finite resources, it’s not wise for us to aspire to this either. So why not consider sharing or hiring instead of owning – especially with items you don’t use often such as lawnmowers, tools and other quality household, garden and leisure items. The average power drill is used for just 15 minutes in its lifetime! Whether you share with friends or neighbours, or look for (or set up!) a local share shop to borrow items for a small fee, you will reduce both your outgoings and waste. One of the best ways to create a wave of change around ocean plastic is to lead by example in the hope that it will inspire those around you to take action too. Support our work and help spread the word about ocean plastic. You can order printed copies of our posters and postcards to display at your workplace, school or in your community, or to hand out to friends, or use as educational materials.